Crime doesn&apos;t pay, and to learn that, all you need is a quarter. For the entire month of February 2017, the admission is only 25 cents to all visitors. John Dillinger, the infamous Depression Era gangster met his demise outside of the Biograph Theater in Chicago. The movie? Manhattan Melodrama. The cost? A quarter. Learn the story of Dillinger, his gang and the rise of the FBI who took Dillinger and a number of other criminals down during the mayhem of the 1930s. 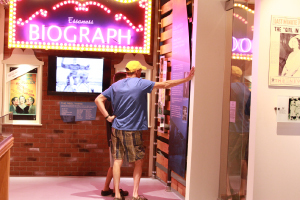 Through the interactive journey at the John Dillinger Museum, you&apos;ll follow Dillinger through his childhood in Indiana, his prison sentence and his bank robberies throughout the Midwest. Along the same timeline, follow the FBI and their modern advancements in crime fighting as well as Agent Melvin Purvis and other Federal, State and local police officers that helped capture these notorious criminals. The Museum moved to the historic Courthouse in the summer of 2015. A tribute to the local law enforcement and individuals who have lost their lives in the line of duty can be seen on the Memorial Wall. Also new to the Museum is the original indictment of John Dillinger - donated by the Lake County (Indiana) Courts. The John Dillinger Museum is located inside the historic Lake County Courthouse in Crown Point, Ind. Hours of operation are Tuesday through Saturday from 10:00 a.m. to 5:00 p.m. and Sunday noon to 4:00 p.m. The Museum is closed on Monday. Normal admission prices range from $2-$4 - active fire, EMS, military and Hoosier Helpers are always admitted for free! 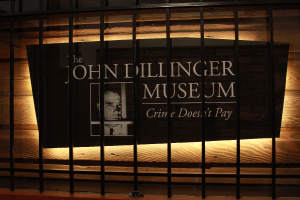 During your visit to the John Dillinger Museum, be sure to visit the boutique shops, antique stores and restaurants surrounding the beautiful historic Courthouse. Learn more about the Museum at dillingermuseum.com or Crown Point, Ind. at alongthesouthshore.com.